Nelson Mandela said of the Free State: "The Free State landscape gladdens my heart, no matter what my mood. When I am here I feel that nothing can shut me in, that my thoughts can roam as far as the horizons." The Free State Province lies in the heart of South Africa, with the Kingdom of Lesotho nestling in the hollow of its bean-like shape. Lying between the Vaal River in the north and the Orange River in the south, the region is one of flat, rolling grassland and crops fields, rising to lovely sandstone mountains in the northeast. The Golden Gate National Park is a Free State Nature Reserve in South Africa, located in the north eastern part of Free State and derives its name from the brilliant shades of gold cast by the sun on the sandstone cliffs, especially the imposing Brandwag rock. - "Click on Pic"
Gariep Dam is the biggest Dam in South Africa and attracts fishing enthusiasts and boat lovers. 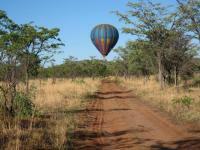 It is surrounded by nature reserves with wildlife running on open plains.- "Click on Pic"